A big thank you to everyone who supported the Coppull Festival Fundraiser at the Unity Club. We can now run our festival with confidence. I must thank opening artist Jan Hough. Jan is an accomplished musician and performer and gave a great eclectic set that set the scene for the evening. Next up was Copperface Jack, a new duo debuting the folk scene. Alan and Sharon won many friends with their powerful vocals and solid guitar work. Then cam the star of the show, Anthony John Clarke. This amiable Irishman from Belfast, had the crowd in his pocket with his patter and jokes. His mastery of the guitar and his beautiful self penned songs resulted in a great performance and a great night. A special thanks goes to my old mate Dave Gaskell (AKA Bad Grandad), who did a fantastic job on the sound, and to my great pal Kevin Brady for doing the job of at least 3. Lastly thank you to our audience for supporting us again in large numbers. Without you our festival wouldn't exist. So roll on 8, 9 10 June and come and enjoy the free music and the craic and hopefully the sun! This was another wonderful concert. We were so sorry that Tony couldn't be there but the group, including Tony's brother did us proud, and gave us another terrific night of music and craic. We are very grateful and honoured that every year they've supported our fund raising efforts with such great success. We missed you Tony and send good wishes and hope that you feel better soon. The Weavers were ably supported by Ken Scally, Pete Southworth and Bad Grandad (Dave Gaskell). Thanks to all the artists and you the audience for making this another memorable night. Thanks to the backroom team who sold the tickets and helped behind the scenes especially Ken Scally the organiser, Kevin Brady and Albert Schanzel. The next fundraiser features Anthony John Clarke on Friday 11 May, 2018 at the Unity Club. We look forward to seeing you there and to another great night of live music. THANKS TO THOSE WHO HAVE SUPPORTED US. 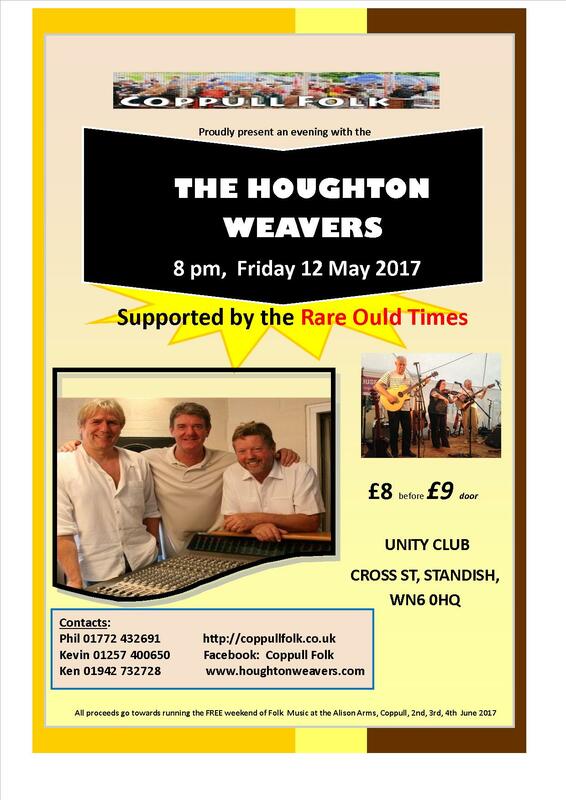 THE HOUGHTON WEAVERS ARE COMING BACK! 23 February at 8 pm at the Unity Club, Cross St, Standish, WN60HQ. Ticket £9. the Alison Arms, Coppull, 8, 9 and 10th June 2018. Just to let you know that we will not be having a singaround on Wednesday 27 December. The next one is Wednesday 3 January 2018. Thanks for all your support throughout the year. MERRY XMAS AND A HAPPY NEW YEAR TO ALL OF YOU. This the first of our 3 fundraisers for next year's FREE music festival at the Alison Arms in June. 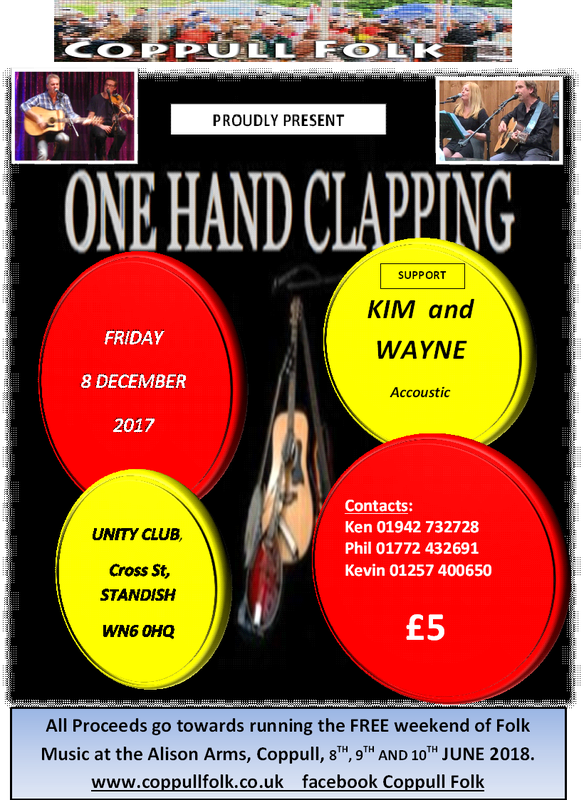 It should be a great night with the lively One Hand Clapping supported by the magical singing of Kim and Wayne. We are always grateful for your support. We had 13 helpers to put the tent up. Thank you to the team and all your hard work. The Henry Priestman and Les Glover and friends set was an great start to our Festival with brilliant off the cuff humour and original songs. They bounced off each other all night and we loved it. There was much hilarity and laughing and the ‘Talc Attack’ refrain originating from two young lads running through the tent throwing talcum powder at each other, was visited often during the set. This was Ken Scally's extravaganza and that it was. Pete Southworth gave us a lovely rendition of his own compositions. Ken Scally delivered a wonderful selection of music hall/ Lancashire songs and poems. Jan Hough sang and played a varied set which demonstrated her fab voice and versatility using ukulele, bodhran and guitar. 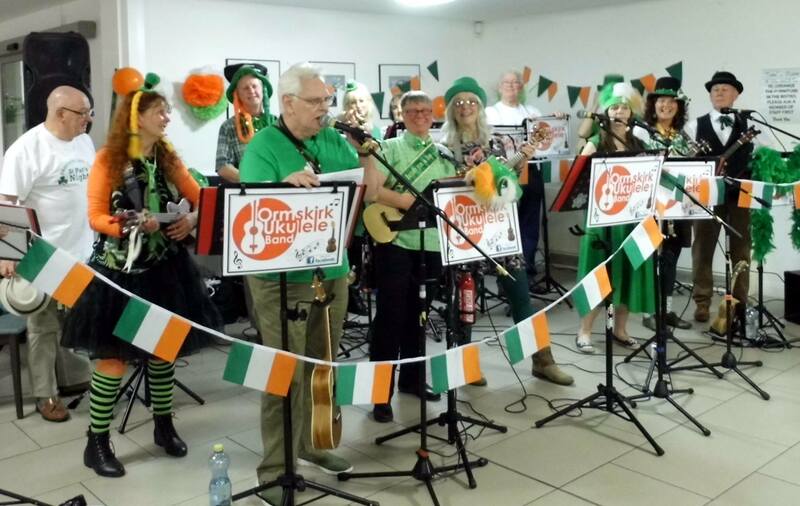 Jan was followed by 10 members of the Ormskirk Ukulele Band. They were colourful and fun and sang many favourites from the 60's and 70's. This was indeed a terrific afternoon of live music. All brilliant local talent and enjoyed by a large audience. Thanks Ken. Saturday night opened with Chris Rogan with his delightful laid back and pleasant patter. His self-penned songs and a few covers were delivered with clever guitar accompaniment. We enjoyed this first set. Then it was the turn of Drop the Floor. This was the highlight of a very full on day of live music. They just blew us away. That combination of guitar, banjo, fiddle and Uillean pipes played by virtuoso musicians was pure magic. 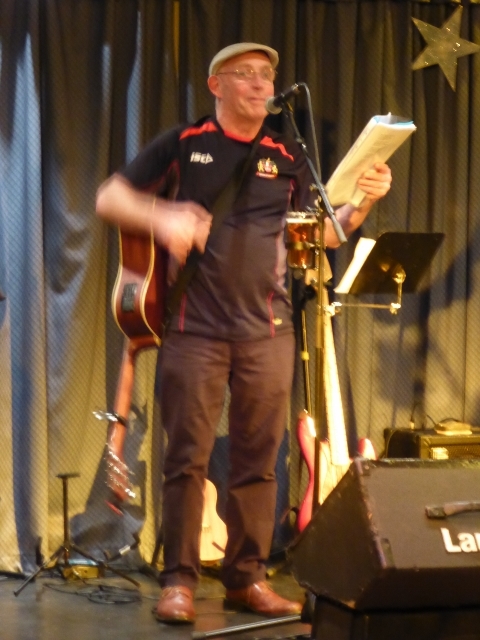 Richard Moss interspersed this Irish dance music with some lovely Irish and Blackburn songs and got us to join in. It was a perfect set and was not only the highlight of today but of many festival gigs we have had. Well done lads. You are all so talented. Thanks to Westminster Sound and Bill for providing great sound. This was the open mic event. We had a least 21 performers either singing, playing or saying poetry. It was a showcase of local and visiting talent and with the sun shining, was most enjoyable. Tonight we had the pleasure of two cracking groups. Vision Thing with our own Shelly set the pace with a mixture of their own material and covers and a lovely version of Cooleys reel. ‘The Ould Triangle’ was one of the many songs where the audience joined in and the atmosphere was wonderful. This group are on the up and deserve to make it big. They were fantastic. They were followed by the Mather/Robinson. Band from Manchester. Their sound was amazing. They were lively, funny, musical and different. Their songs, mostly their own, covered history, politics and current affairs, and were cleverly written. It's a pity that so many had to leave early. The audience that remained stayed because they loved them. Thank you to all the artists who entertained us so well all weekend. Thanks to Bill Sproson who provided magnificent sound. Thanks to Mavis and Ron and the team for working so hard and providing the venue and beverages. Thanks to our Coppull folk team especially Ken Scally, Kevin Brady and Phil Regan. Thanks to the sun for coming out and to all the people who came to make this weekend another special festival. Les hails from Liverpool and has a great stage presence and is an excellent guitarist. He has a wonderful repertoire of songs and we look forward to him opening up our Festival this year. “Loved up Les, one man, a guitar, and a pile of great songs” – James Watt (BBC Radio Presenter) ‘Men of a certain Age’, “one of many enjoyable numbers on his debut album” – R2 Magazine. 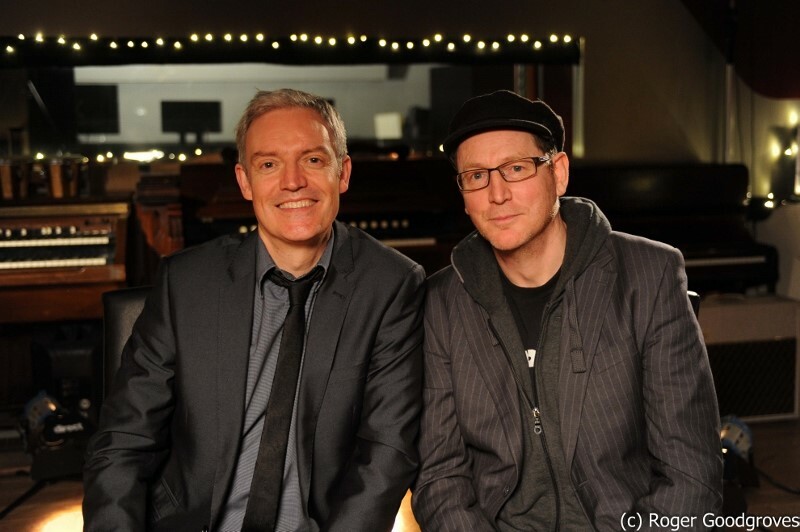 Henry Priestman has been entertaining us by either penning great songs (‘Ideal World’ and ‘Words’ are but two), during his time in the Christians or, since 2007 as a solo artist. His two albums ‘Settle Down’ and ‘The Last Mad Surge of Youth’ have got great reviews. “…. he is a fine songwriter with an acerbic wit when it comes to his take on relationships, work, life and how some of us are getting slightly older but not quite ready for it yet…” Maverick. “Henry and Les have great chemistry” – Graham Gouldman (10cc) Together they produce a great music sound on various instruments and with Henry’s wit, promise to give us a great first night. Ken has been a stalwart promoter of the festival for 6 years and is a very talented musician and all round folk singer. 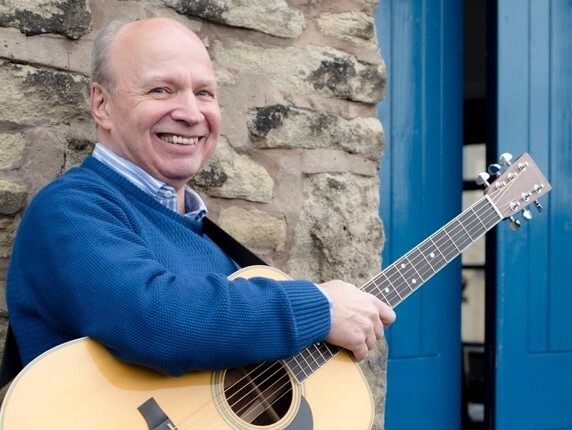 He specialises in traditional Lancashire songs, poems and stories, bringing them to life in his own inimitable way. Saturday afternoon is his spot where, not on does he do a great set, but he invites guests to grace the stage with a different theme each year. There is so much untapped talent in the Wigan area. Saturday afternoon will be as enjoyable as ever. Pete is one of our regulars at the weekly singaround at the Alison Arms, and pens many thoughtful topical songs about life and places. He is still in the process of making his CD which will contain many of his interesting songs. Steeped in the 60's protest singer style, his songs sometimes take on an older old time country feel with a lovely laid back style. He has a very clever way with words. Jan is another prolific singer/songwriter. 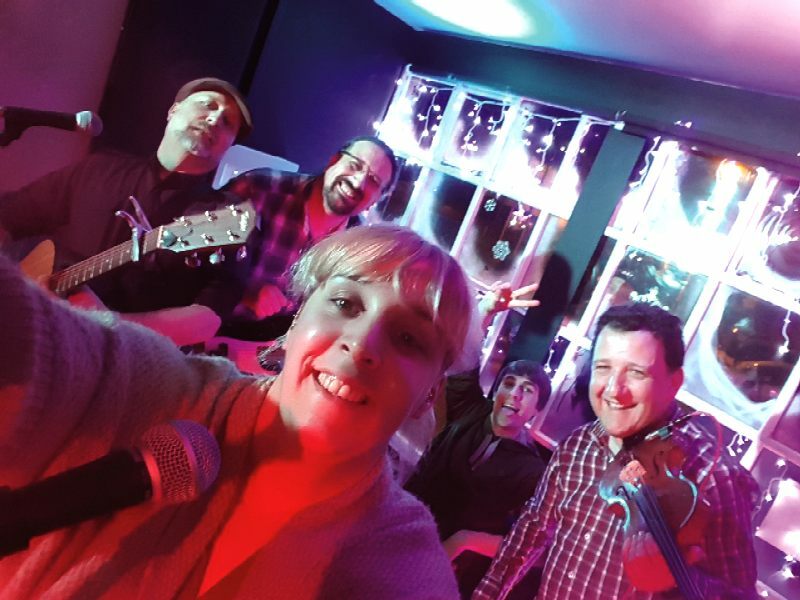 She is highly entertaining and very talented versatile musician featuring guitar, ukulele and bodhran. She believes in magic and loves the moon and stars and wild animals, plants, flowers, bees, etc and is always looking on the bright side of life and nature. So watch out for some unusual humorous songs and our only female performer this year. This band are a lot of fun. They love dressing up for the big occasions and entertain with a wide repertoire. They are well received wherever they go and should end the Saturday afternoon concert with some tunes for us to sing along to. This is their first visit to the festival and we look forward to them very much. Sounds of Folk's Ali O'Brien describes Chris as "the kind of voice you could just listen to for hours" whilst Folk North West said "a master songwriter and performer". His songs tell the story of the people and things around him in a very easy, touching style. After a gap of several years, Chris has returned to the folk circuit. He has an engaging stage presence and will have you singing along in no time. His Two cds WHERE FANTASY FLIES and SET MY DREAMS FREE have had great reviews and his third CD is about to be released. 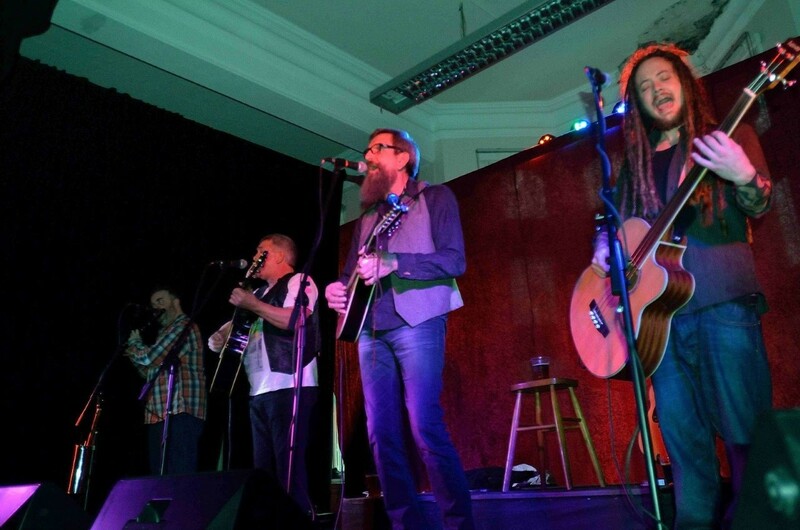 DTF are a four piece vocal and instrumental group based in Clitheroe, Lancashire. 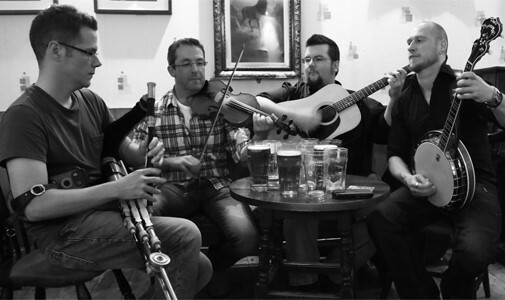 Firmly routed in the traditional music and songs of Ireland but also taking from Scotland and Lancashire, the band features Steven Johnston on Uilleann Pipes, Martin Baptie on Fiddle, Richard Moss on Guitar and Vocals and Daniel Burke on Tenor Banjo. All musicians are virtuso in their own right and Richard Moss (who also does solo gigs) blends his vocals to their vibrant musical set. Be prepared to be wowed by this music. "Vision Thing", a five-piece hailing from the North West, produce harmonious and beautiful music many of which are their own compositions. 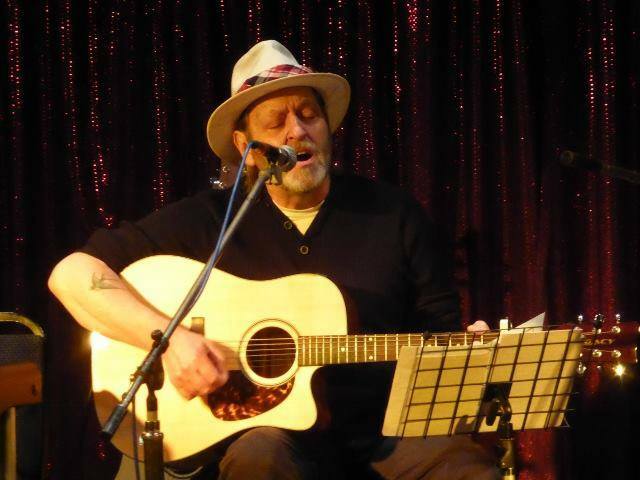 Pete Cunliffe - Vocals and acoustic guitar - is a prolific songwriter. Cherlene (Shelly) Walmsley - Vocals. 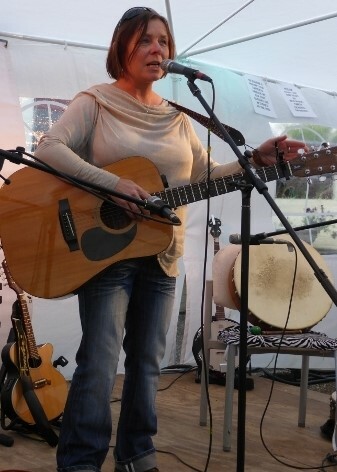 Shelly is popular member of our own Coppull Folk Club, and has a powerful and distinctive voice. Paul Cunliffe - Ukelele bass and electric bass - Paul is a veteran of many bands, and is an accomplished music engineer, and produces albums at his studio in Southport. David Windsor - Violin - David plays a 100 year old violin through a variety of effects producing "a tone and texture to die for" Ian Cripps, FATEA magazine February 2017. Jon Ormrod - Percussion - Jon adds the beat on djembe and cajon percussion, making for a portable and effective rhythm unit. Be warned The Mather Robinson Band get in your face right from the very first note. It's a fair bet subtlety isn't a word the band is familiar with, which is not necessarily a bad thing. Their music is solid, their songs often politically motivated and their lyrics scythe like. Many will remember that sort of thing from when a lot of folk had an edge which so often seems dulled of late. The band from Manchester, seem to have come out of the shadows where they have be lurking for some time. There is something wonderfully loose about their music it almost seems like when they are playing they want to get on, get it done and get to the bar. Anthony Quinn, Dave Mather, Pete Robinson and Chris Mather give you thoughtful, witty , lively music. They should provide a rousing end to the festival 2017. And, all entertainment is FREE. Mavis and Ron kindly provide the bar facilities and venue. All we ask is that you support Mavis and Ron by buying your drink from them, and contribute to the odd raffle that provides funds to host the Festival. 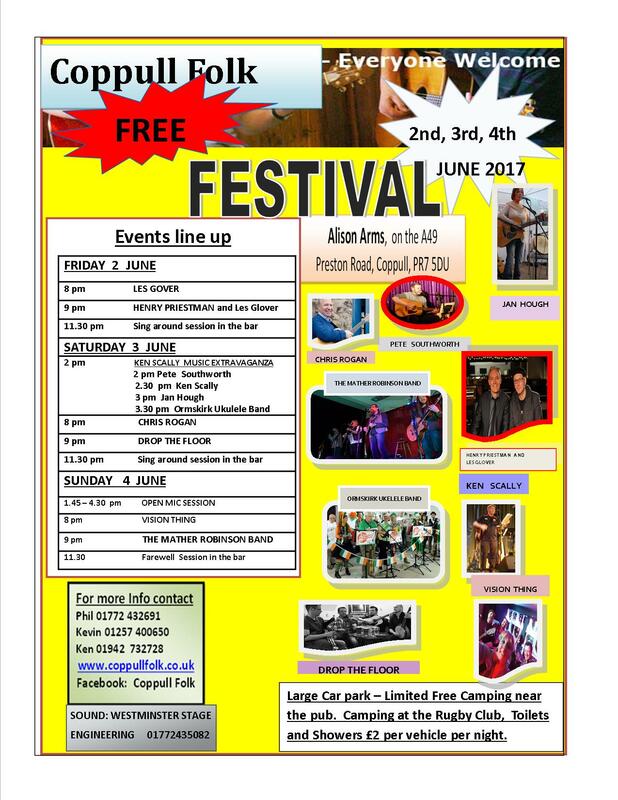 Coppull Folk invite you to come over to the Alison Arms anytime over the weekend and enjoy this wonderful friendly venue, for great music. Festival line-up on Festival Page. Click on FREE FESTIVAL at top of the page.